Free Christmas Sled Scene. Click the image to view and download the full-size version. 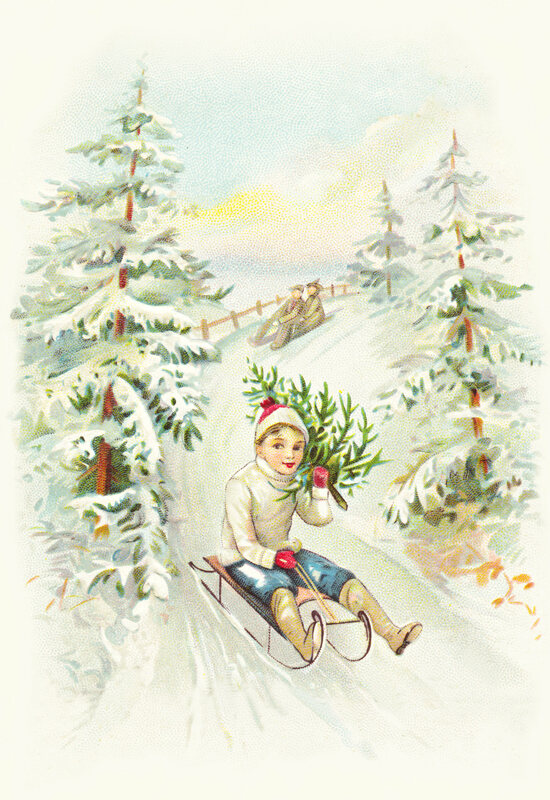 A wonderful Christmas Sled Scene, featuring a boy on a sled, a Christmas tree slung over his shoulder. There’s snow and pine trees all around him. Just behind him are two adults on a sled. One gets the sense that he and his parents went looking for the perfect tree and found it. There’s a date on the back of the image. I can’t fully make it out, but I believe it’s 1914. This image will be great for so many holiday and winter projects. It’s a bright image, great for lifting spirits and instilling some holiday cheer during the winter gray. I hope you find it useful for your creative projects. This entry was posted in Christmas Graphics, Christmas Tree and tagged antique image, Christmas clipart, Free Christmas Sled Scene Graphic, free graphics, vintage image on November 7, 2014 by ClipArtPlace.